"Black Mesa (New Mexico)" redirects here. For several summits in the United States of the same name, see Black Mesa (summit). 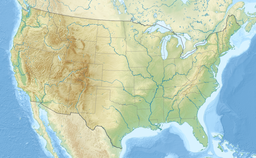 Colorado / New Mexico / Oklahoma, U.S.
Black Mesa is a mesa in the U.S. states of Colorado, New Mexico, and Oklahoma. It extends from Mesa de Maya, Colorado southeasterly 28 miles (45 km) along the north bank of the Cimarron River, crossing the northeast corner of New Mexico to end at the confluence of the Cimarron River and Carrizo Creek near Kenton in the Oklahoma panhandle. Its highest elevation is 5,705 feet (1,739 m) in Colorado. The highest point of Black Mesa within New Mexico is 5,239 feet (1,597 m). In northwestern Cimarron County, Oklahoma, Black Mesa reaches 4,973 feet (1,516 m), the highest point in the state of Oklahoma. The plateau that formed at the top of the mesa has been known as a "geological wonder" of North America. There is abundant wildlife in this shortgrass prairie environment, including mountain lions, butterflies, and the Texas horned lizard. The prairie rattlesnake is well adapted to Black Mesa's dry environment. 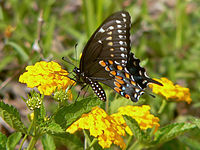 Papilio polyxenes, the state butterfly of Oklahoma, is found on Black Mesa. ^ a b c d "Black Mesa, CO". Geographic Names Information System. United States Geological Survey. ^ a b c d "Black Mesa, NM". Geographic Names Information System. United States Geological Survey. ^ a b c d e f g h Lewis, Tom; Richter, Sarah Jan. "Black Mesa". Encyclopedia of Oklahoma History and Culture. Oklahoma Historical Society. Retrieved June 30, 2015. ^ Reader's Digest (2003). Off the Beaten Path: A Travel Guide to More Than 1,000 Scenic and Interesting Places Still Uncrowded and Inviting. Reader's Digest Association. pp. 270–. ISBN 978-0-7621-0424-6. ^ "Abducted By UFOs! Sooners Report Close Encounters". NewsOK.com. January 23, 1994. Retrieved October 17, 2017. ^ Richter, Sara Jane (July 2011). The Oklahoma Panhandle. Arcadia Publishing. pp. 28–. ISBN 978-0-7385-8295-5. ^ Capace, Nancy (March 1, 1999). Encyclopedia of Oklahoma. North American Book Dist LLC. pp. 130–. ISBN 978-0-403-09837-8. ^ Hoppe, Bruce (February 1, 2006). Don't Let All the Pretty Days Get by. Back-To-One Books. pp. 70–. ISBN 978-0-9777611-0-4. ^ "Oklahoma High Point - Black Mesa - Kenton OK". Retrieved December 12, 2011. ^ a b c d "Oklahoma:Black Mesa Nature Preserve". The Nature Conservancy. Retrieved May 27, 2013. ^ "Black Mesa (Oklahoma) – Climbing, Hiking & Mountaineering". Mountain Forecast.Com. Retrieved May 28, 2014. ^ a b c d e "Black Mesa". Sam Noble Museum: The University of Oklahoma. Retrieved May 28, 2013. ^ "Suneson and Luza, A Field Trip Guide to the Geology of the Black Mesa State Park Area, Cimarron County OK" (pdf). Oklahoma Geological Survey. 1999. Retrieved May 26, 2013. ^ a b c "Checklist of Oklahoma Preserve Mammal Species" (PDF). The Nature Conservancy. July 3, 2011. Retrieved May 27, 2013. ^ "Checklist of Oklahoma Preserve Reptile & Amphibian Species" (PDF). The Nature Conservancy. July 3, 2011. Retrieved May 27, 2013. ^ "Checklist of Oklahoma Preserve Bird Species" (PDF). The Nature Conservancy. July 3, 2011. Retrieved May 30, 2013. ^ a b "Checklist of Oklahoma Preserve Butterfly Species" (PDF). The Nature Conservancy. July 3, 2011. Retrieved May 27, 2013. ^ "Checklist of Oklahoma Preserve Fish Species" (PDF). The Nature Conservancy. July 3, 2011. Retrieved May 27, 2013.